But Rauner, a Republican, also said that he’s open to a new solution and that there is no one element of his plan that must be included for him to sign on to a deal. But while those high-level meetings are apparently ongoing, Rauner has not been a part of them. As the state’s chief executive, Rauner’s signature would be needed on a deal, but he expressed no interest in participating. Cupich has reportedly been involved in an effort supported by Rauner that would create a state-run private school scholarship pool, which would be donations of individuals and businesses receiving a tax credit in exchange. Some Illinois schools are set to open in a matter of days, but they won’t receive their major payments from the state until a new funding formula becomes law. That funding is in limbo as a largely partisan fight continues in Springfield. Rauner used his amendatory veto power to rewrite the measure that Democrats approved this spring, but Democrats and a lone Republican, Sen. Sam McCann of Plainview (who is reportedly considering a primary run against Rauner) on Sunday overrode those changes. The Illinois House now has 15 days to do the same, or the entire measure dies. At least four Republicans would need to join with Democrats in order to reach the supermajority needed for an override. Representatives will be in session Wednesday. While a dozen Republicans bucked Rauner by helping Democrats to pass a budget and accompanying income tax increase last month, it’s unclear whether there will be a similar splinter when it comes to the battle over education. While there is widespread agreement that Illinois needs to do more to support districts that lack the local property wealth to properly support student learning, there’s a dispute over how to go about achieving equity. While Rauner supports sending more money to schools, the governor says that budget is out of balance. “Our budget is broken, it’s not balanced,” he said. However, Rauner did not identify a single cut that he would make to state spending. Shortly after that budget battle, Rauner made major changes to his staff, dismissing Chief of Staff Rich Goldberg and replacing him with Kristina Rasmussen, who had been serving as the president of the Illinois Policy Institute, a think tank that supports limited government. The change has been described by political insiders and media as Rauner making an ideological shift to the right. Aug. 13: Governor Bruce Rauner’s attempt to put his stamp on school funding met its demise Sunday, when a single Republican senator joined with the chamber’s 37 Democrats to reject Rauner’s rewrite of a significant school funding measure. 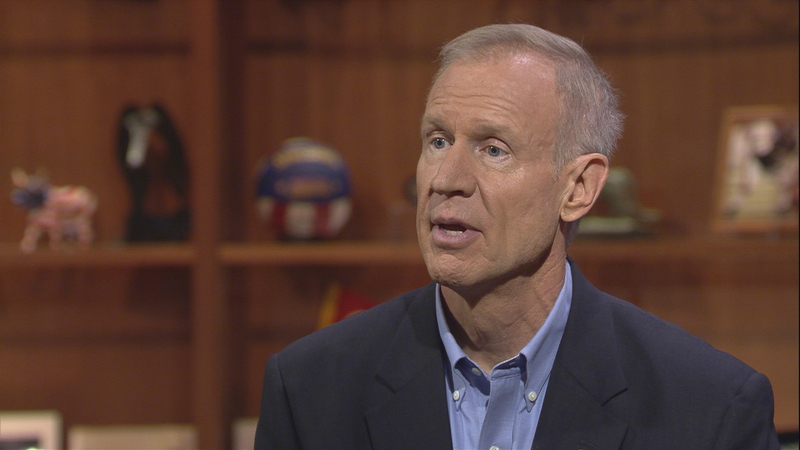 Aug. 11: The governor’s sit-down with WTTW will come a day after the Illinois Senate is scheduled to vote on his amendatory veto of Senate Bill 1—a plan that rewrites how Illinois decides how to divvy up state funding for schools.